Do You Really Know Alabama? I fished that quarry lake in the 80s. Had a shotgun stolen from my truck while I was fishing. Sorry, I needed the money. Sayre Speedway is my second favorite racetrack in Alabama, behind The defunct Dixie Speedway in Midfield. When I was a kid, my dad would take us every Saturday night to the Montgomery International Speedway. Used to watch some of the greats like Bobby and Davy Allison, Red Farmer and others. Bobby Allison was my favorite. Sorry, ITE. What exactly does it mean to be an "international" speedway? They let a Toyota run one time? Instead of just selling the shotgun, a real entrepreneur would have leveraged it into the contents of a convenience store till. Young people have no ambition anymore. 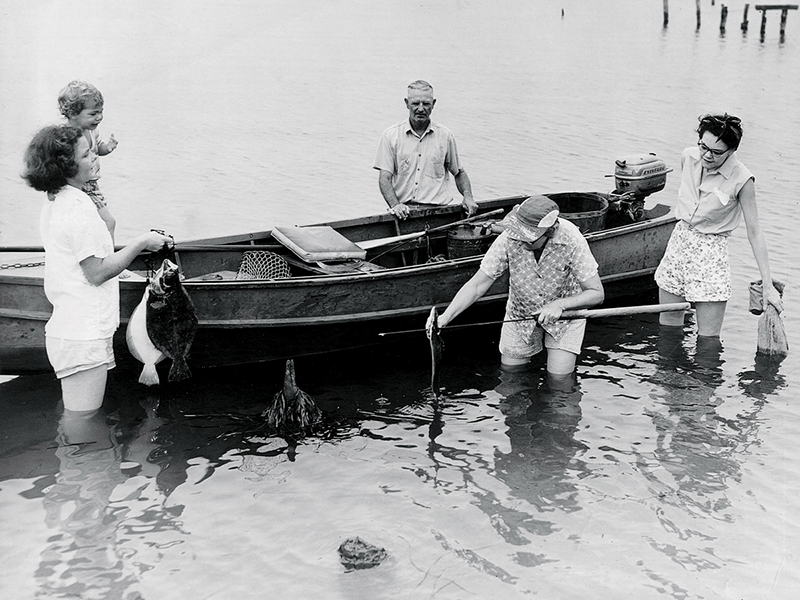 Daphne residents display fish and crabs caught during a "jubilee," ca. 1950. A jubilee is a phenomenon that occurs during summer evenings when large numbers of sea life move toward the shore in Mobile Bay. Jubilee is the name used locally for a natural phenomenon that occurs sporadically on the shores of Mobile Bay, a large body of water on Alabama's Gulf Coast. During a jubilee many species of crab and shrimp, as well as flounder, eels, and other demersal fish will leave deeper waters and swarm—in large numbers and very high density—in a specific, shallower coastal area of the bay. A jubilee is a celebrated event in Mobile Bay, and it attracts large crowds, many drawn by the promise of abundant and easy-to-catchseafood. The Mobile Bay jubilee typically takes place at least annually, and sometimes several times per year; years without a jubilee have been recorded, but they are exceedingly rare. Many accounts of the jubilee exist, the oldest dating back to the 1860s. The size, scope, and duration of the jubilee can vary greatly. Sometimes a 15-mile (24 km) stretch of coast representing most of the eastern shore can be affected, and at other times the extent can be limited to as little as 500 feet (150 m) of coastline. Most jubilees happen in the pre-dawn hours. Author Archie Carr comments, "At a good jubilee you can quickly fill a washtub with shrimp. You can gig a hundred flounders and fill the back of your pickup truck a foot deep in crabs." Except during jubilees the water inside the 2 meter contour along the eastern shore is well oxygenated. This shallow water extends several hundred meters offshore. During jubilees fishes present there are trapped between the shore and an advancing water mass low in dissolved oxygen; the water at the surface and very close to shore usually has enough oxygen to support them for the short duration of most jubilees. 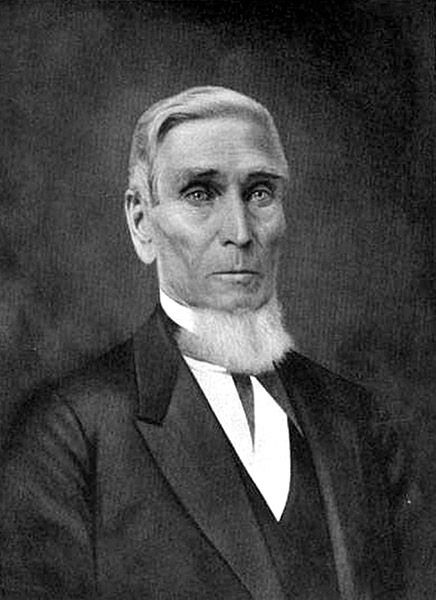 Daniel Pratt (1799-1873) was Alabama's first major industrialist and founded the present-day city of Prattville as a self-sufficient manufacturing center a few miles northwest of Montgomery. His factory complex, Pratt Gin Company, became the world's largest manufacturer of cotton gins, supplying machines to Alabama's Black Belt planters as well as ginning facilities as far away as Russia. 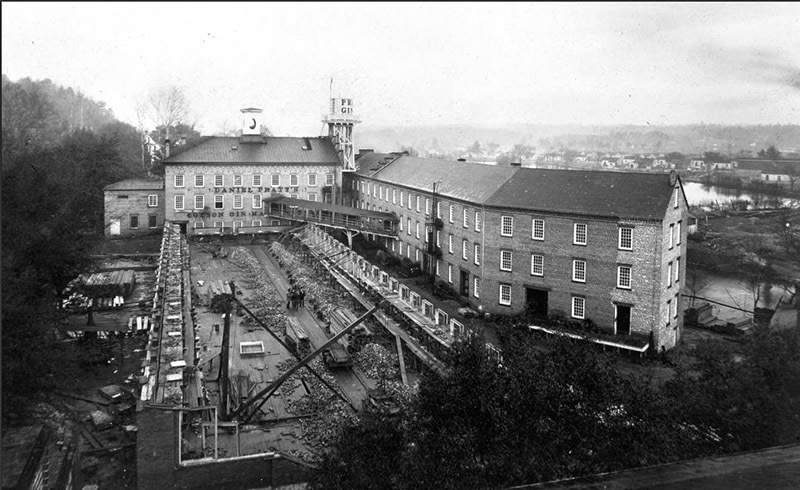 Pratt's diversified business enterprise included grist and flour mills, architectural millworks, and cotton and woolen mills. After the Civil War, Pratt directed his attention to economic development in north Alabama and became involved in building railroads and developing the vast coal and iron resources surrounding Birmingham. Pratt was instrumental in Alabama's transformation from a predominantly rural agrarian economy to a more diverse industrial economy devoted to manufacturing and the production of coal, iron, and steel. Daniel Pratt was born in Temple, New Hampshire, on July 20, 1799. His father, Edward Pratt, was a yeoman farmer who had moved to New Hampshire from Reading, Massachusetts. Daniel was the fourth of six children, all of whom were brought up under strict religious discipline and were obliged to work on their family's small New England farm. Daniel received a limited education and was apprenticed to an architect at age 16. He may have chosen this vocation because his paternal grandfather, for whom he was named, had become modestly wealthy as a woodworker in Reading. In 1819, at the age of 20, Pratt earned release from his apprenticeship and sailed for Savannah, Georgia. Pratt worked at his trade in this seaport town for two years and then moved inland to Milledgeville, Georgia, the new cotton-growing center of the state. For the next several years, Pratt built plantation homes for wealthy planters in the vicinity of Milledgeville and Macon. These homes were some of the most beautiful in the state, featuring large white columns, broad hallways, and spiral stairways characteristic of the neo-classical style popular during the period. By 1827, Pratt was one of the South's leading builder-architects. On September 6, 1827, he married Ester Ticknor of Columbia, Connecticut, whom Pratt met while she was visiting her brother in Clinton, Georgia. Daniel and Ester had three children, but only daughter Ellen survived infancy. Soon after his marriage, Pratt met Samuel Griswold, another New England transplant in Clinton. Griswold manufactured cotton gins and was so impressed with Pratt's skills that he asked him to manage his factory. After only one year, Pratt's mastery of the business earned him a partnership with Griswold. Pratt promptly tried to convince Griswold to expand the business into Alabama so that they could follow the westward expansion of cotton culture and take advantage of Alabama's river system to transport and distribute gins. Griswold initially agreed to the venture but changed his mind because of increasing conflicts between settlers and Creeks in central Alabama. Undaunted by the potential dangers of the frontier, Pratt moved to central Alabama with his wife, two slaves, and enough materials to construct 50 gins. He formally named and founded the Daniel Pratt Gin Company around 1833, and in about 1836 he leased a site on Autauga Creek known as McNeil's Mill and began manufacturing cotton gins. Two years later, he purchased 1,822 acres of land further up Autauga Creek, where he constructed a permanent factory and founded the town of Prattville. During the 1850s the Pratt Gin Company was a global enterprise, shipping cotton gins to as far away as Russia, as well as to countries in Europe and South America. Pratt used Alabama iron in the manufacture of his gins and imported steel from England. The old Tannehill Furnaces site in Roupes Valley, 12 miles southwest of Bessemer off Interstate 59/20, constitutes one of the oldest industrial sites in the BirminghamIron and Steel District. Founded in 1830 as a small plant for smelting iron, Tannehill expanded during the Civil War into a large battery of three blast furnaces capable of producing 22 tons of pig iron daily for Confederate military needs. The ironworks, along with a dozen other such facilities in Alabama, were badly damaged in the closing months of the Civil War. 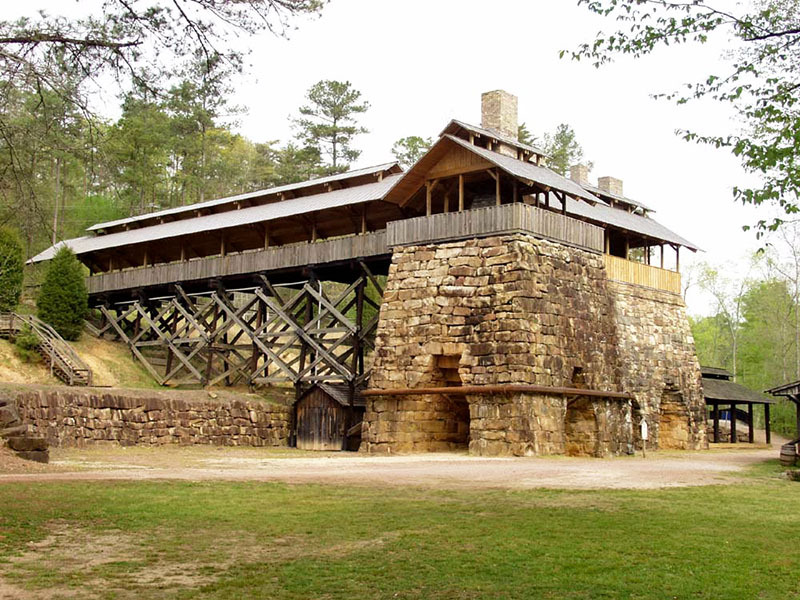 The remains of the furnaces, among the best preserved in the South, are the centerpiece of the 1,500-acre Tannehill Ironworks Historical State Park, created by the Alabama Legislature in 1969 as a memorial to the state's early iron industry. The furnaces are listed on the National Register of Historic Places and the Civil War Discovery Trail. The site also has been designated an international landmark by the American Society for Metals. 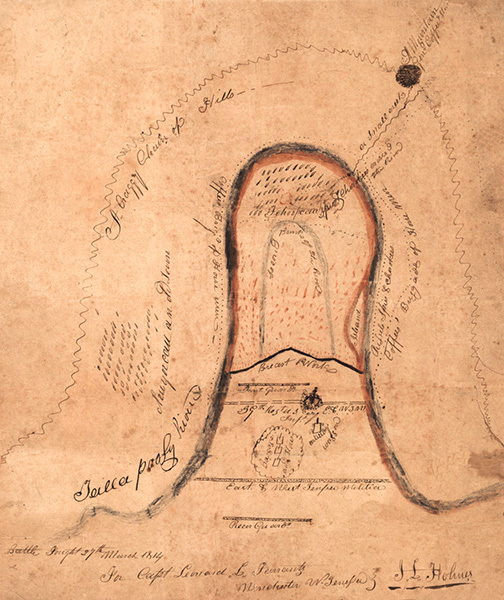 The manufacture of iron began at Hillman Bloomery on the site, during Andrew Jackson's presidency, primarily to serve area farmers who were settling in the lower Appalachian region in increasing numbers. Markets for the iron included Jonesborough, Elyton, and Tuscaloosa. Bloomeries were early forges that made small amounts of wrought iron directly from ore for tools, plows, and cooking utensils. The builder, Daniel Hillman, was enticed to the area by Abner McGehee, a railroad investor from Montgomery. 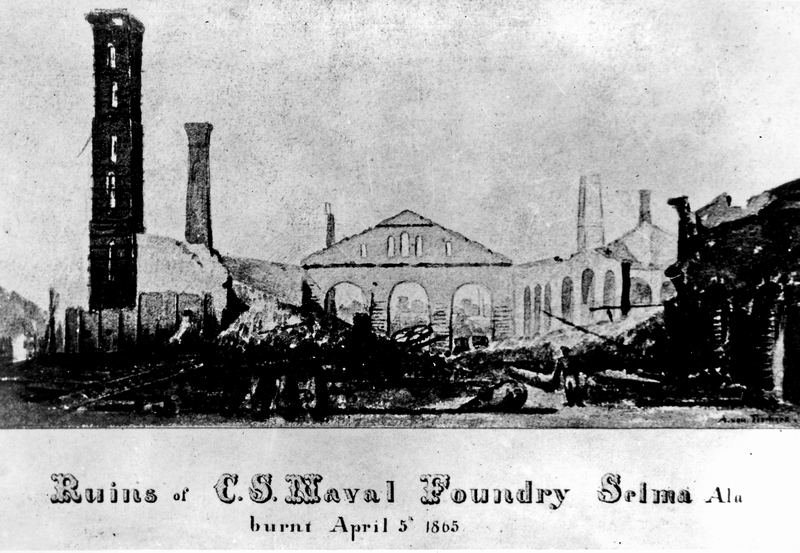 A foundry at Tannehill manufactured eating utensils, pots, and skillets for the Confederate Army, but most of the pig iron was sent by rail to the Selma Arsenal and Gun Works to be cast into munitions and iron plating for battle ships. A nearby tannery made harnesses, canteens, and other leather products for military needs. Hundreds of workers, many of them enslaved, were engaged in Tannehill operations cutting trees, making charcoal, mining ore, and operating the plant facilities. The furnaces were massive, 30-foot-high truncated pyramids constructed of 400-pound sandstone blocks topped by brick draft stacks. Workers fed iron ore, limestone, and charcoal fuel into the top of the pyramids, and molten iron was tapped from the bottom every six hours. Air forced into the chambers encouraged the reduction of the ore by creating temperatures exceeding 2,700°F. The Tannehill facility was targeted for destruction as part of Union general James H. Wilson's raid into Alabama; it was attacked by three companies of the U. S. Eighth Iowa Cavalry on March 31, 1865, under the command of Capt. William A. Sutherland. Wilson's cavalry operation, which involved more than 14,000 troops, burned every Alabama furnace but one, the Hale & Murdock mill near Vernon, in Lamar County. The 1300-1500's are considered "prehistoric"? The Tennessee Coal, Iron and Railroad company (TCI), founded in 1852 in Tennessee as the Sewanee Mining Company, became the most significant iron and steel company in Birminghamafter entering the area through an 1886 merger. During the financial panic of 1907, TCI became the primary southern subsidiary of the United States Steel Corporation (U.S. Steel), eventually becoming a division of the company and ending its life as a separate entity in the 1950s. Throughout its existence, TCI played a dominant role in the economy of Birmingham and the surrounding area, owning vast acreage of land and coal and iron ore mines and producing iron, steel, tin, and various related products in its Fairfield Works. After its founding in Tennessee, TCI went through several rounds of financial setbacks and recoveries before, during, and after the Civil War. While under the control of cotton broker John H. Inman and Nathaniel Baxter Jr., a bankerwhom Inman named president, the company turned its eye toward the burgeoning coal and iron industry in Birmingham. Another Tennessee entrepreneur, Enoch Ensley (who had been rebuffed in his attempt to join TCI in Nashville), purchased the Pratt Coal and Coke Company, to which he added the Alice Furnace Company and the Linn Iron Company. Alfred Shook, who had been connected with TCI, and T. T. Hillman, a Birmingham ironman, bought options on Ensley's holdings and subsequently sold these to TCI. In the largest merger seen to that time in the city, TCI entered the Birmingham district with the transfer of ownership on December 28, 1886. In addition to the Tennessee holdings, TCI now owned 76,000 acres of coal land, 460 coke ovens, two blast furnaces, and 13,000 acres of land that included the Red Mountain iron ore seam. The company moved its headquarters to Birmingham in 1895. Local industrialists hoped to develop steel plants as a local market for the existing pig iron industry. 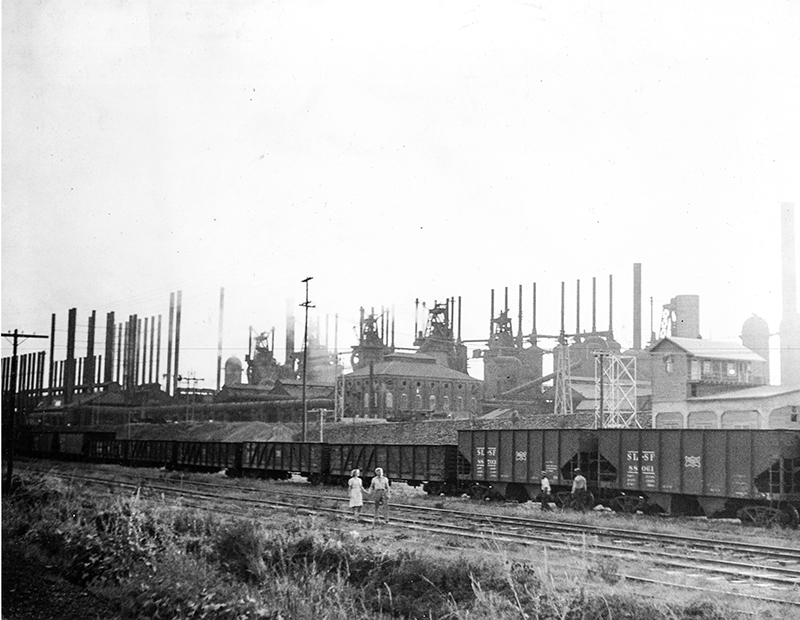 That same year, TCI began producing basic pig iron for northern customers, who converted it to steel, and in 1898 began constructing an open-hearth furnace for manufacturing steel at TCI's Ensley plant. The furnace began operation on Thanksgiving Day, 1899, launching Birmingham as a true competitor in the national iron and steel industry. Enoch Ensley (1832-1891) was an important figure in the industrial growth of what is known as the "Birmingham District." Noted primarily for his active involvement in the coal and iron-making industry in Alabama, he was responsible for the construction of several large blast furnaces for making iron as well as planning and founding the industrial town bordering Birmingham that bears his name. Ensley was born in 1832 to a wealthy family near Nashville, Tennessee, and was intended to follow family tradition and practice law. His early interests apparently centered around horses, and after graduating from the Lebanon Law School in Lebanon, Tennessee, he engaged in trading horses and operating stables. Thanks to a sizeable inheritance, he acquired numerous properties in the Memphis, Tennessee, area through his real estate company and subsequently amassed additional wealth. Extremely ambitious, Ensley hoped, with the support of backers in Memphis, to eliminate the Tennessee Coal, Iron & Railroad Company (TCI) from competition in the southern coal and iron industry. TCI, run by John Inman, had refused Ensley's attempts to buy his way into the company, which Ensley took as a personal slight. Ensley is perhaps best remembered as the first person in Alabama to conduct a "million-dollar" business deal, although the ultimate sum was much less. In 1881, arriving in Birmingham, he arranged to buy the Pratt coal mines from industrialist Henry F. DeBardeleben, who was looking to move westward to find relief from tuberculosis. Ensley reportedly wrote a $600,000 check on the spot and shortly thereafter bought a majority interest in both the Alice Furnace Company and the Linn Iron Works, although some sources say the payments were made over a six-year period. Combining these entities in 1884, he created the Pratt Coal and Iron Company. Ensley then began to acquire land, which resulted in his owning a substantial amount of real estate in the rapidly growing Birmingham area. Ensley and his mining engineer, Llewellyn Johns, increased output in the Pratt mines by digging additional mine shafts. Ensley also pressed the Alice furnaces, known as "Little Alice" and "Big Alice," into competition with each other as well as with the Sloss furnace. This approach resulted in "Big Alice" producing 150 tons of pig iron in a single day in 1886, which set a record for southern blast furnaces. Ensley committed to founding the town of Ensley, envisioned as a center of manufacturing and steel production. 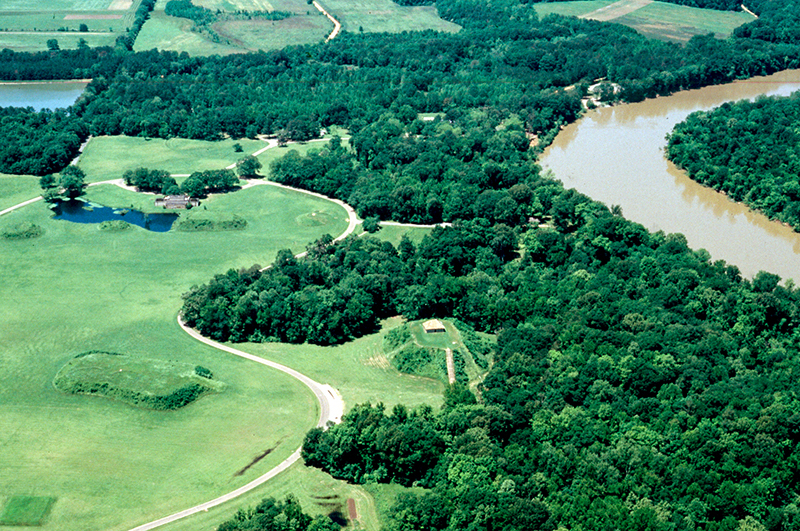 Ensley acquired 4,000 acres of TCI land to form the Ensley Land Company, which was incorporated in December 1886. Initially, stock in the Ensley Land Company sold well, and elements of the urban infrastructure, such as sewer lines, were installed. Unfortunately, Ensley's inability to follow his own plans meant that although lands for sale were widely advertised, he postponed the sale date to complete the hotel he was building. The complications caused by the lack of income from the delayed sale of lots worried investors. The town eventually did become an industrial center as envisioned by Ensley, but that did not occur until the turn of the twentieth century. in 1887, the "Big Four" blast furnaces at the city of Ensley were constructed on a site chosen by Ensley to allow for an adjoining steel mill. The simultaneous construction of four large blast furnaces was at the time unheard of and involved the largest order for blast furnace blowing engines ever made at one time. On April 11, 1888, the first of the four furnaces became operational; the other three would follow in succession, with the final one being lit on April 29, 1889. The lighting of the last of the "Big Four" was the last major event undertaken by Ensley in his tenure as president of TCI. 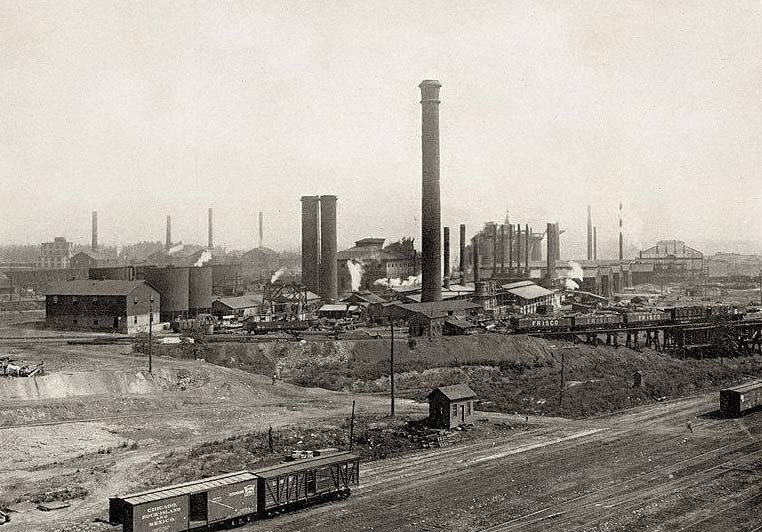 Although the furnace complex was successful, the Ensley Land Company had fallen into severe debt as a result of the overly speculative nature of the region's real estate and declining pig iron prices. 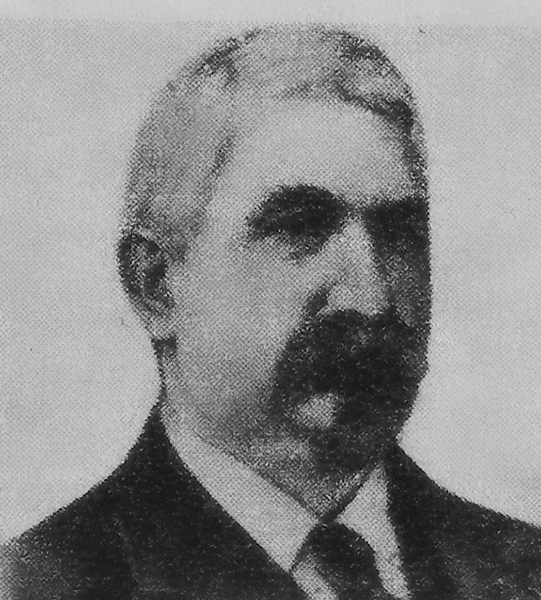 Ensley ultimately resigned from TCI in 1887, sold his personal stock in the projects in the Birmingham District, and left in search of other business opportunities in the Sheffield area. Enoch Ensley died in 1891, before his business schemes truly bore fruit; his property went into receivership. Steel would eventually be produced at a TCI plant located in Ensley, the first to be made in the Birmingham District, but it would not be until Thanksgiving Day in 1899. The town did become an industrial center as envisioned by Enoch Ensley after the turn of the twentieth century.